The flowers are dead. The butler has gone missing. The family patriarch has scurvy. Your brother has tried to kill you for your share of the inheritance. Twice. And worst yet, the tea is tepid. Seeing as it’s the Edwardian era, these are just the beginning of your problems! 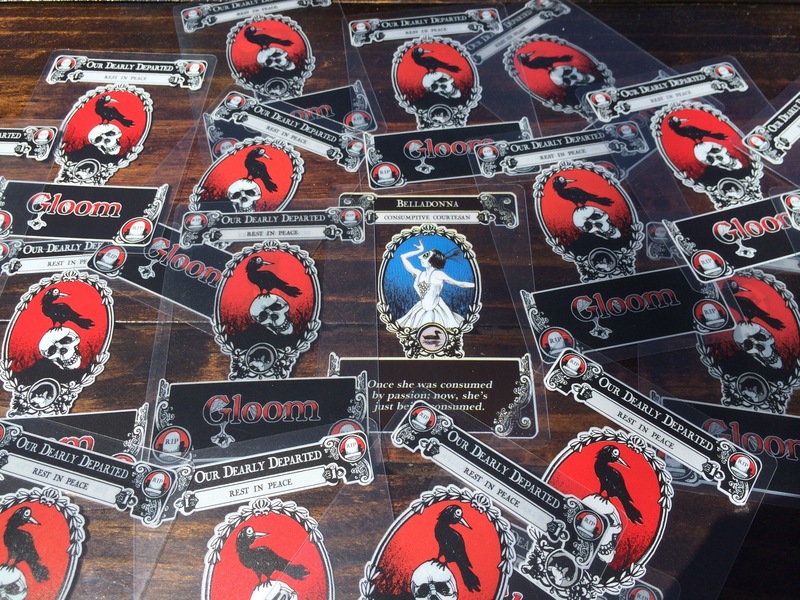 Gloom is a card game for two to five (or more with the expansions) players, created by Keith Baker and featuring art from Michelle Nephew and J. Scott Reeves. Before the review proper: These cards are gorgeous. Made out a translucent plastic and featuring art that reminds me of Charles Addams meets German Expressionism, this game is visually one of the most unique little card games I have ever laid eyes on. The game is coming up on it’s 10 year anniversary, and even today I have yet to find a card game that is as visually interesting as this one. Now, Gloom is a very simple card game. You take a family of five in Edwardian England, and make sure they have the most miserable existence known to man before causing them to die a horrible, tragic, and hopefully fitting death. The game ends when some one has completely killed off their family, and whoever has the most miserable family wins. Each card that isn’t a family member (or house, if you use the expansion Unhappy Homes) include a “Self Worth” score, ranging from -5 to -25, and sometimes in multiples of three. They’ll make your game a bit harder usually, forcing you to discard cards or not play certain types of cards, but makes it more likely for you to win by having the most tragic story. Of course, there are good experience cards, ranging from 0 to +25. These will make your game easy, but your story becomes a perky happy tale, and we all know you can’t end a story like Gloom’s with some one happy and successful! You can only kill family members with a negative self worth score. Now, if you haven’t gathered from the previous two paragraphs? This game is, despite it’s subject matter, a funny game. A genuinely funny game! Your family members can be Mocked by Midgets, Persued by Poodles, Get Old Without Grace, and all these brilliant and humorous ways to have a miserably bad experience. Which is a good thing! It’s interesting, though, that at it’s core Gloom is a story-telling game. You could just play the cards and make your characters miserable and make other characters happy and their player miserable, but then you’re missing a good chunk of the fun. How WAS the family dog shanghaied by pirates, meet the mayor, have tea with the queen, and then married a rhino, who eventually poisoned him on the honeymoon? And yes, all of these happened from a game of Gloom that was played. So, in spite my cheering and praise, I have to admit that Gloom isn’t really a flawless game. The major problem is that it’s hard to know when exactly certain things take place: If I was to play a card saying that “Your hand is now limited to four” on myself, only to play a card stating that “Your hand size is increased by two”… Is my hand size six now? There doesn’t seem to be a clarification rule included in the game, though a little Google search has lead me to Atlas’ Games Gloom FAQ. If I were to give “points”, I’d have to chop off a few for some muddy rules. That aside, I genuinely enjoy Gloom. If you have some friends with a love for A Series of Unfortunate Events or a dour sense of humor, pick it up and give it a go! Skip-A-Turn Variation: Enemy of my Enemy: For a game with 4+ players. After selecting your family, pick another family and work as a “team” to make each other miserable and every one else happy. Guaranteed to start a fight! This Post was posted in Card Game Reviews and tagged Card Games, catd game reviews, comedy, gloom, story games. Bookmark the permalink. Oh wow, Series of Unfortunate Events! That’s exactly what I was thinking the whole time I was reading this. “Pursued by Poodles” definitely sounds like a Lemony Snicket phrase. This is very well written. Can’t wait to read more! That is very, very true! An older copy of Gloom can look like it went through a nice sand paper massage! It’s the downside of such a stylish product, I assume. I tend to be very protective of my games, so mine only has minimal weather. The worst looking card in my group is the Pursued by Poodles card, because I just can’t not share with people interested in the game.